New to Texas and based in Houston, Cypress & The Woodlands, Katy and Sugarland, Owners Charu, Deepali and Rush are ready to get children excited about science, engineering, art, math (S.T.E.A.M.) while they have fun. Snapology has been in Houston area for over three years. In 2019, Snapology is introducing new and exciting programs and will be teaming up with more daycares, local public and private schools, and churches as well as host fun learning events and entertain at private birthday parties. A list of our current Partners can be viewed on our website. Snapology of Cypress & The Woodlands owner, Charu Palkamshetty holds a Bachelor of Arts from India. She has 10 years of corporate experience in US and 9 years outside the US. She has a background in psychology and understands the importance of education and encourages children in her community. With her own children in mind, Charu was eager to bring Snapology’s STEAM-based education lessons to the Children of Houston, TX. Snapology of Cypress & The Woodlands owner, Deepali Chanana holds an MBA in Finance from University of Houston. She has 14 years of experience in transportation industry where she gained expertise in data analysis, management, budgeting and training. Her experience and expertise in management, finance and training contributes a vital asset for the success of Snapology. Having Children of her own Deepali likes to encourages kids to achieve their goals through STEAM. Snapology of Sugar Land and Katy owner, Rushdi Husain an accountant for an oil and gas company for 10 years has been implementing STEAM concepts in schools and communities for last 3 years. His interest in STEAM, and specifically hands-on learning through building bricks, began while playing with his own nephews when they were around 5-7 years old. He observed the level of critical thinking and adaptability that they were able to pick up from simple tasks. This sparked the interest to bring similar hands-on learning concepts to eager learners everywhere. 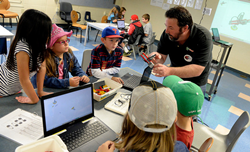 In addition to being introduced to robotics and science, technology, engineering, arts and mathematics (STEAM) concepts, Snapology students learn skills like patience, teamwork, leadership, presentation and have a place to engage their creativity. With over 60 locations throughout the United States and Internationally – the company plans call for opening 20 new locations per year, moving forward in the coming years. Within Houston Metro area, there are multiple locations - Katy, Sugarland, Richmond, Missouri City, Pearland, Friendswood, Klein, Cypress, Houston, Spring, The Woodlands, Tomball, Conroe. Snapology offers a wide array of interactive, play-based activities for children ages 1-14 – including enrichment classes,birthday parties,workshops, camps, scouting events and field trips – mainly using building materials such as LEGO® bricks and other similar building tools and technology. The programs can be customized based on the number of children, age of children and time allotment, and can be broken down into individual classes, such as superhero or Ninja themed events, competition robotics teams, science classes, team building events and motor skill development courses that are perfect for pre-school children. Additionally, the curriculum is designed to benefit gifted and traditional students, as well as children with special needs, including those with sensory processing and autism spectrum disorders. Noting that Snapology’s work is about re-defining play and re-imagining learning. Founded in 2010 and franchising since 2015, Snapology's mission is to provide children with an opportunity to engage in playful learning activities that stimulate creativity and an interest in learning. Using LEGO® bricks and other building toys, Snapology emphasizes STEAM principles, teamwork & socialization. With over 60 locations currently open and operating Internationally, company plans call for expanding nationally with its unique, education-based franchise opportunity. Snapology brings on board innovative teachers who believe in having fun while teaching. There is always a need for creative and energetic teachers who wants to join the Snapology family; for more information, visit https://www.snapology.com/locations/cypress.